Shaina Ettel captures the heart and soul of Jewish music like no one has done before. The sound is right, the songs are powerful, the music is timeless. Experience the beauty of heavenly music sung with a heavenly voice. Just released in Israel and now ready for worldwide distribution! A beautiful new CD of 13 Chabad niggunim......sung like you have never heard before. Shaina Ettel, a professionally trained vocalist, lives is Jerusalem having made aliyah 4 years ago. This mastered CD was produced at the Muso studio there and consists of 13 selections with Shaina Ettel accompanied by both piano and full orchestration. 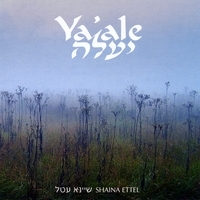 The CD comes with an 8 page insert with text in English and Hebrew. Shaina Ettel brings a fresh approach to traditional Jewish music as never heard before. She captures the heart and soul of Chabad niggunim and will capture your hearts and souls as well. The sound is heavenly, the songs are powerful, and the music is timeless. This recording will become your favorite from the start and you will listen to it again and again. The music will go straight to your heart and lift you up — Ya’ale. The woman's voice is precious and regarded as a treasure. It is reserved for her husband and family, and is to be shared with other women. "Your voice is crystal clear and very melodious." There is so much strength and energy in Shaina Ettel's voice that when she belts out a note, I want to inhale the joy that she exhales. The voice I hear conveys soul-shaking conviction and compassion. This singer speaks in a language I do not speak and yet I understand. This is an outstanding breakthrough from a woman we should all notice no matter what our race, creed, or native language.